Last week I was away with the family for a vacation at the Outer Banks, NC. Getting back this weekend I wanted to cook something as I had not cooked on my Big Green Egg in several days. My last post featured my latest toy: The Joetisserie. The chicken for that cook didn’t turn out as good as I had hoped because I had too much lump charcoal in the Big Green Egg. Anxious to improve my cooks with this rotisserie tool, I tried again! This time I cooked my version of Peruvian Chicken or Pollo a la Brasa (literal translation is grilled chicken). I paired this with an Aji style sauce which most people refer to as “Green Sauce”. Now sit back, grab an ice cold Pilsen Callao, and enjoy this post for Kamado Style Peruvian Chicken. Start with fresh garlic, lime juice, and cilantro for your marinade. Adding spices like cumin, paprika, oregano, salt and pepper give the chicken that distinct flavor. Rub the chicken with the marinade as well as make pockets between the skin and the flesh of the bird. I poured the marinade in the breast and thigh area before marinading this chicken over night. The trick to getting the bird to cook evenly is to use less charcoal and pile it to one side. Once gray, I pushed the lump to the back side and placed the rotisserie spit on the Joetisserie. I checked the chicken every 20 minutes to ensure it was cooking evenly. This bird took 90 minutes to cook before it measured 165° with an instant read thermometer. To make the “Green Sauce,” use garlic, cilantro, lime juice, mayonnaise, sour cream, and fresh jalapenos (leave some of the seeds in for more heat). 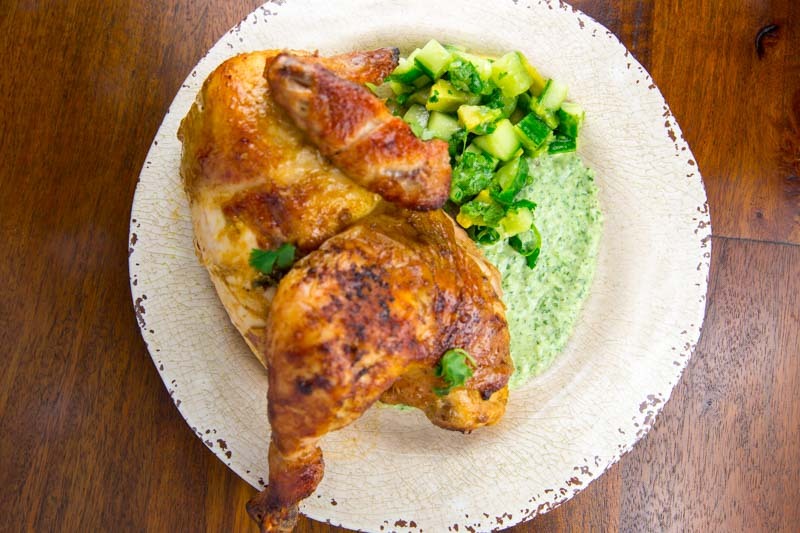 To serve, carve the chicken and pair with a side of green sauce and a simple avocado and cucumber salad. Enjoy! This recipe for Kamado Style Peruvian Chicken is perfect for rotisserie style cooking. Use the Joetisserie if you have one and enjoy this delicious meal! Combine all of the ingredients except the chicken in a blender and blend until smooth. Clean the chicken and pat the chicken dry with paper towels; place the chicken in a bowl. Using your fingers pull the skin from the flesh over the breasts and legs, do not tear the skin as you want the marinade to stay inside the bird. Take most of the marinade and spread evenly underneath the skin, and spread the remaining marinade over the skin. Marinate the chicken in the refrigerator at least 6 hours or overnight. Set the Big Green Egg up for rotisserie cooking using the Joetisserie. Preheat to 350° pushing the small pile of lump to the back of the fire box. Truss the chicken and place on rotisserie spit. Cook for 1 to 1.5 hours or until the bird measures 165° with a Thermapen in the breast meat. Carve the chicken and serve with green sauce. This is the real deal "Green Sauce" served with Peruvian Chicken. Leave some jalapeno seeds in for that extra heat! Mix all of the ingredients in a food processor. Place in the refrigerator overnight as your chicken marinates.